Those who would like to own chickens for egg production – whether a few backyard birds for family sustenance or hundreds of hens for commercial enterprise – do well to remember that their layers are not wild game birds. Chickens used in agriculture are of a domesticated variety that requires the same intense care and feeding as other livestock. First among their needs is shelter. Not only does it serve as protection against predators and the elements, shelter also works to manage nutrition input and waste output. This is why there are important specifications to include when learning how to build a chicken coop. The central requirement in learning how to build a chicken coop is having the right plan from which to work. The placement, dimensions and specifications of the plan will depend on how many chickens need to be housed. Primary considerations are protection, space, light, ventilation and access to food/water (this includes easy access for humans to disburse food and clean droppings). All such priorities will be addressed in terms of total occupancy. While not the most important aspect, appearance should also be a variable when selecting the right design for the poultry house. Any coop should include a perch area for sleeping and a nest area for laying. With a set number of chickens in mind, you can create your own design or acquire a pre-conceived blueprint. An excellent resource to help resolve such decisions is your local cooperative extension office. 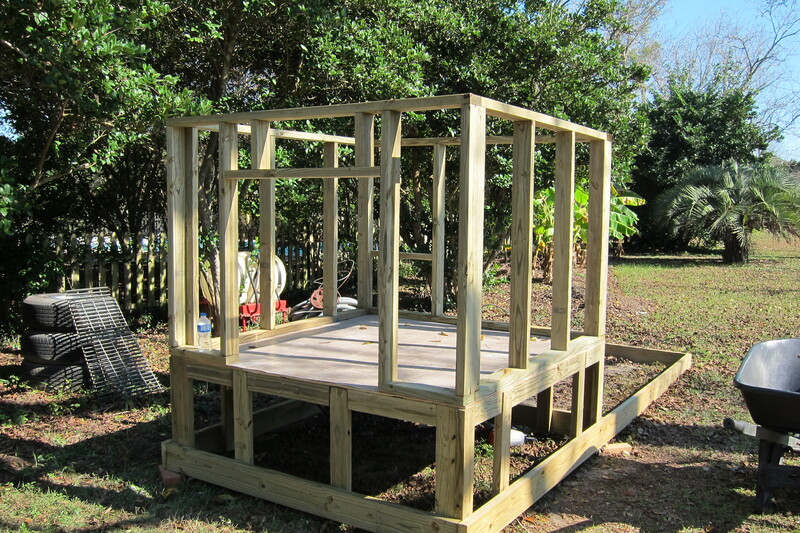 Learning how to build a chicken coop is not all hammers and boards. Before putting saw to plank, the first order of business is to clear the project with local or county zoning authorities. Even a small chicken coop may require some form of variance in some municipalities. Inevitably, chicken coops produce noise, manure and odor so local governments have an interest in minimizing these byproducts in order to keep abutting property owners undisturbed. Among the sources worth consulting are zoning officials, planning board members, health inspectors, township engineers and animal control officers. Fill out all required paperwork and wait for approval before starting work on your hen house. The last thing you need is to complete the project only to be ordered to demolish it. Since protection is of prime value when learning how to build a chicken coop, the right materials are essential to shield the birds from predators, thieves, and excessive cold or heat. There are other factors to think about, as well. As most chicken coops are made of wood, you will want a wood that decomposes the slowest. Woods that are intrinsically resistant to rot – cedar or redwood, for example – are worthy candidates. Other options are to treat the wood with pesticide or to get a soft wood and apply a sealer. Chicken wire mesh is still the best barrier for the outside sections of the coop (aka the run). Important to remember are sturdy and stable locks and latches: raccoons have a knack for disabling all but the strongest of them. How to build a chicken coop begins at the bottom, with a solid foundation. Many chicken farmers find it useful – once the dimensions are established – to surround the area with concrete blocks, partially submerged in a shallow trench. The blocks can be found at any home improvement store or masonry dealer. Once embedded, the blocks should be checked with a level. Supplementing the trench with sand can assure an even and constant plane. It goes without saying that firmer ground is preferable to avoid any sinking. Worth noting is that a double layer of concrete blocks will give additional strength to the foundation. That said, doing so may not be necessary and will add to the overall cost of the project. The happy reality in how to build a chicken coop is that once the frame is assembled, the rest of the project is coasting. Most often, frames are comprised of two by fours. In addition to height, length and width, your frame will define the angle at which the roof rests. For the more able wood worker, connecting the two by fours by means of lap joints is an excellent way to strengthen the frame against high winds and fierce storms. If winds are a regular problem, sink a four by four plank about three feet into the ground; then, bolt it to both the concrete block and the frame. Additional protective measures are to coat the ends of the frames with water sealer and attach metal flashing to the bottom of the frames in order to divert excess water. Depending on the design you pick (or create), frames should include a doorway between the coop and the run as well as floors where the nesting boxes will go. 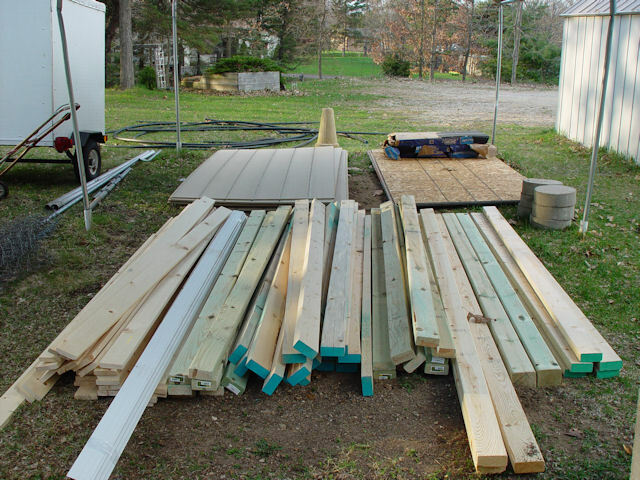 An online survey of diverse DIYers shows a preference for using old fence boards to cover the frame. Fresh lumber does just as well, and gives the builder a choice to purchase rot-resistant wood. Heavy-duty staples work well to attach the chicken wire mesh where the frame surrounds the run. At this point, you can install doors and windows with the appropriately fitted hinges. An inexpensive and quick way to dress it up is to apply self-adhesive linoleum tiles to the floor boards. Other amenities might be a ramp from the coop to the run; a heating regimen for cold nights; and a few lights. Regardless of size, layout, materials or extras, building a chicken coop always aims at the safety, comfort and overall health of your birds. Whether using new or recycled components, the principal goal for most chicken keepers – aside from the fun of it – is to have farm fresh eggs. Solid and agreeable accommodations make that objective more likely. Hey Buddy!, I found this information for you: "How to Build a Chicken Coop: 6 Easy Steps". Here is the website link: https://backtofarm.com/how-to-build-a-chicken-coop/. Thank you.